The rocks of Black Cat Mountain are sedimentary carbonate limestone deposits of the Haragan and Bois d'Arc formations, both part of the Hunton Group. Originally named the Hunton Limestone, this group of formations has undergone revision and expansion to include a collection of carbonate rocks deposited in the Oklahoma region from Ordovician through Devonian times. The structure of the Hunton Group is summarized in the chart below, which I redrew from one of Amsden's charts. A very nice introduction to the origin and nature of the rock components within these formations can be found at the Sedimentary Rocks Tour, developed by Bruce Perry from the Department of Geological Sciences, California State University at Long Beach. Notice how the group spans from the Ordovician Sylvan formation, through a number of Silurian formations, the Haragan and Bois d'Arc formations, which are at Black Cat Mountain, and then concludes at the boundary with the Mississippian Woodford formation. Trilobites have been found in all of these rocks in Oklahoma. Deposition of rocks in the Hunton sequence was not continuous, as indicated by the heavy wavy lines crossing the diagram above at various angles. These lines represent unconformaties, which occurred when sediment deposition was interrupted by withdrawal of the waters and erosion of some of the deposited formation exposed on the surface of the land. Underneath the rocks at Black Cat Mountain are the thick, but often soft strata of the Silurian Henryhouse formation. In other parts of this region in Oklahoma, the Henryhouse formation has offered up a beautiful array of fossils, including a number of trilobite species which are as well preserved as those at Black Cat Mountain. 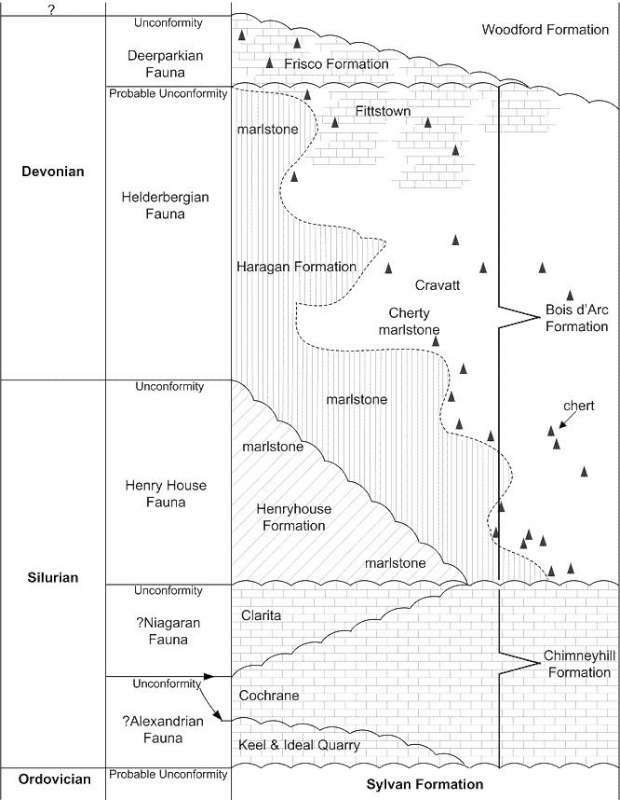 Notice that in some places the Haragan is in direct contact with the Henryhouse formation; in others it is in contact with the Cochrane member of the Chimneyhill formation, and this resulted because the Henryhouse was completely eroded in these places when Haragan deposition began. Above is a panoramic view of the bluff adjacent to the old Hunton townsite, which Taff originally used to name the Hunton Limestone. The series of photographs in this panorama were taken while facing to the east, and then assembled using Autostitch. The lower half of this bluff is the upper Haragan formation, the upper portion consists of lower layers of the Bois d'Arc formation. 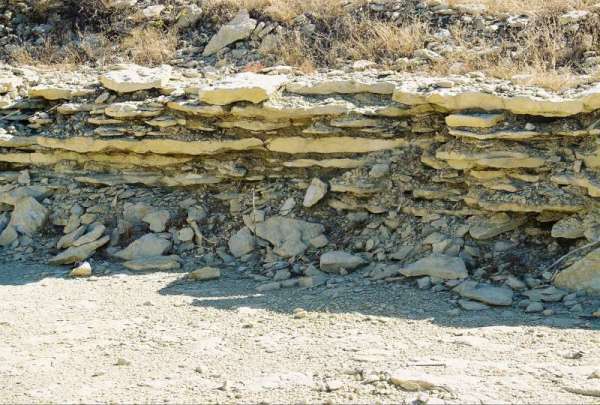 A "flat" bench-like structure, barely visible along the horizontal midline of the photograph, is roughly the dividing line between the two formations, when the onset of vitreous chert nodules appear and continue intermittently up strata. On the far left of the image is a red-roofed barn, originally used to stable horses for the Pony Express and stage coach trail that ran through this region in the later nineteenth century. It also served as the local post office and store for Hunton residents in early years of the twentieth century. The rocks of these formations were formed by precipitation of calcium carbonate from the sea water between 417 and 416 million years ago. 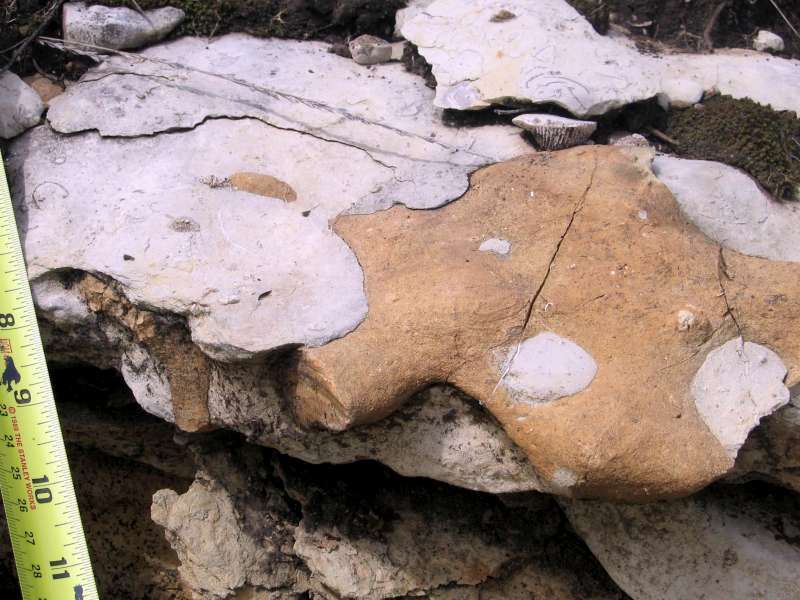 The chert found in interspersed nodules through the Bois d'Arc precipitated as polymeric silica gel from orthosilicic acid, when the concentration of this substance reached a saturation level. As shown in the photographs below these gelatenous globs of silica often entrapped the shells of animals before solidifying (photo credit: Sev Coursen). The presence of this chert is not ubiquitous, as Amsden noted that it tends to feather in and out laterally over the region. When it is not present, the two formations are difficult to distinguish on the basis of rock features and the fossil populations, which appear similar in both cases. Because of this Amsden thought the Haragan and Bois d'Arc were only different facies of the same formation. The general properties and formation of chert are described at Geology.com. Following is a photograph of carbonate laminate in the upper Haragan formation. Natural splitting between the layers is a result of years of weather exposure. Deeper in the hillside these layers merge together, are almost indistinguishable and difficult to separate. 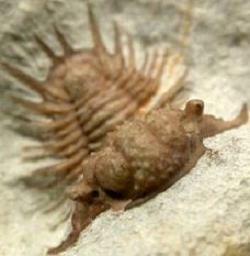 This photograph was taken in one of the trilobite quarries operated by Bob Carroll at Black Cat Mountain. Below is a map of the exposed sedimentary formations in the vicinity of the old Hunton townsite and Black Cat Mountain. This map is shown in the same orientation and approximately the same scale as the location map shown on the page "Where is Black Cat Mountain?" The figure below was redrawn by me from an original plate in one of Amsden's publications on the Hunton Group of Oklahoma. The location of Black Cat Mountain is indicated by the bold arrow in the lower right corner. The bluff over the Hunton townsite shown in the photograph above consist of the left most margin of the map. Note the section line R8E which separates sections 8 and 9 in southwest Coal County, Oklahoma. The approximate location is 2 miles west of Clarita. 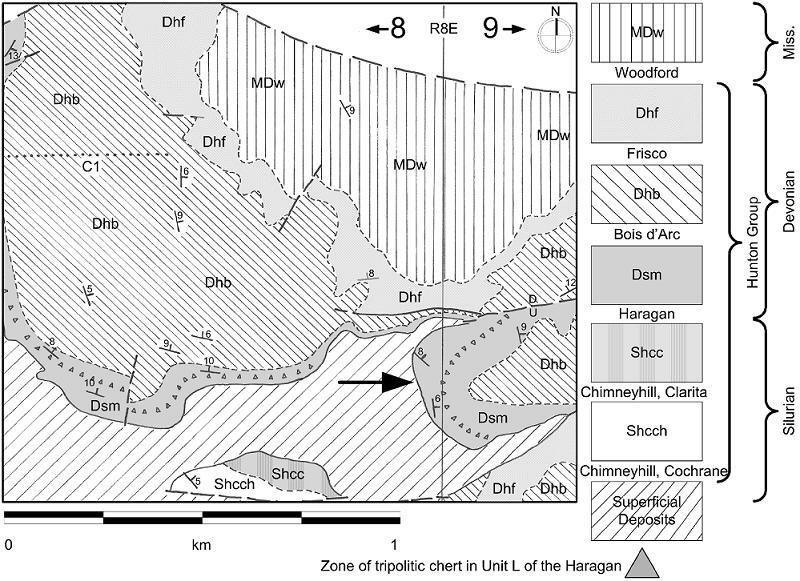 Notice in the geologic map above, the zone of tripolitic chert denoted by gray triangles passing through the middle of the exposed Haragan rocks. This interesting material is different from the higher density, vitreous chert shown above that is more commonly present in the Bois d'Arc rocks. This low density chert only appears in a narrow band of Haragan strata and is soft, easily scratched and porous. The name "tripolitic" comes from a similar material, once mined in Lybia near Tripoli for industrial filtration purposes. I snapped a photo of one of these tripolitic chert nodules at Black Cat Mountain and show it in the image below. It is the orange-brown material surrounded by the white limestone. In an otherwise predominantly carbonate formation, I find the appearance of these chert nodules interesting. They represent temporary changes in the chemical composition of the sea water which may have affected the types of animals that lived in the environment represented by this formation. 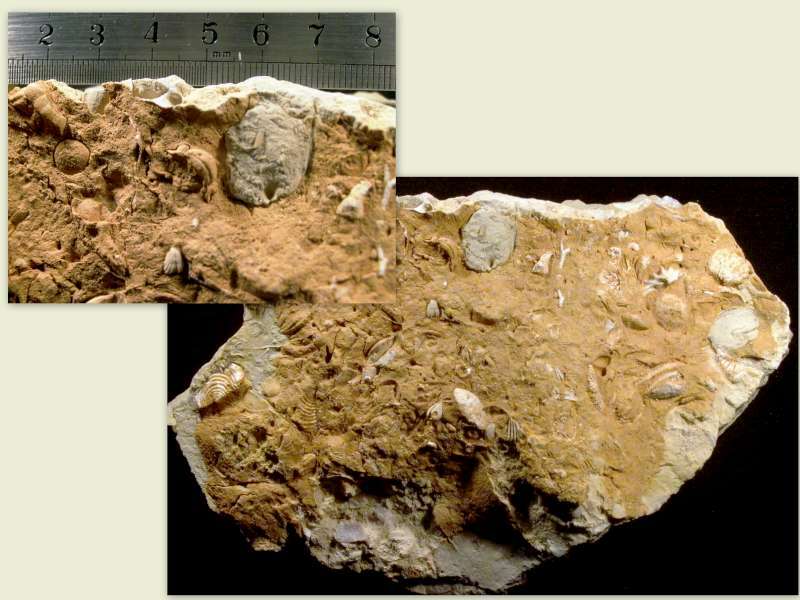 In any event, as an observer moves up from the Haragan into Bois d'Arc rocks where chert is more common, a noticeable change occurs in the number of fossils that have been replaced with silica, the source of which was likely the same as these nodules. 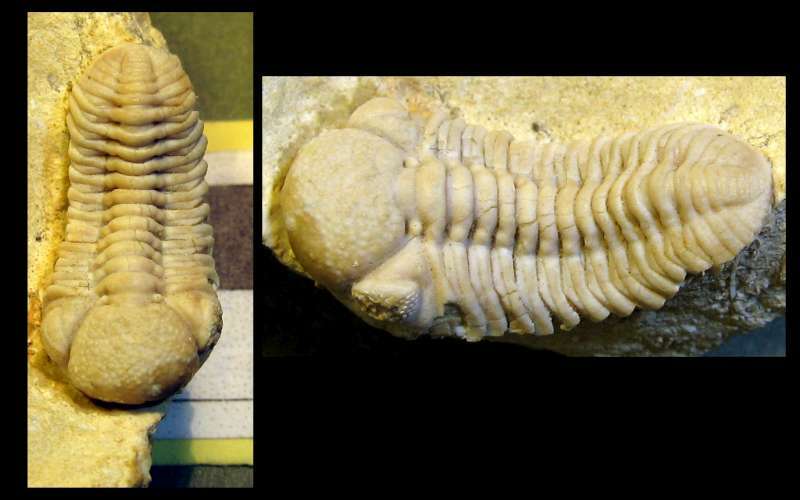 Below is an unusual example of such fossilization, with a Kainops species, about 3 cm long, preserved with silica in a vitreous chert nodule. More information on the geology of Oklahoma can be readily accessed through a publication by Kenneth S. Johnson, who is at the Oklahoma Geological Survey.